Maroon 5 is set to headline the 2019 Super Bowl Halftime Show—for now, at least. While the NFL has not officially announced the rock band will be taking the stage at Mercedes-Benz Stadium in Atlanta, E! News and other outlets confirmed in September Maroon 5 had booked the gig. After the news came out, rumors circulated that Pink and Rihanna had passed on the Halftime Show in support of former San Francisco 49ers quarterback Colin Kaepernick, who was basically blacklisted for "taking a knee" during the National Anthem. 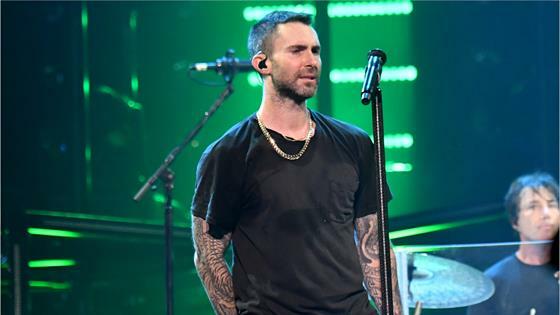 Celebrities like Amy Schumer have urged Maroon 5 to step down, and an online petition was created to encourage the band to drop out of the show; to date, it has over 63,000 signatures. Naturally, the band's frontman, Adam Levine, is conflicted about how to proceed. For months, the singer—who has been named Variety's 2018 Hitmaker of the Year—batted away questions about the band's involvement. Now, he tells the magazine, "I'm still formulating a lot of things." Best Super Bowl Performances Ever! What those things are, Levine doesn't say. To many, it seemed inevitable that rapper Cardi B would join Maroon 5—should the show go on, that is—to perform their No. 1 smash "Girls Like You." But as she told a TMZ paparazzo in September, there's only one way she'll take the stage: "When they hire Colin Kaepernick back." Levine can't imagine the song being what it is without Cardi B's verse. "I told Cardi, 'I want you to put something down that shows your fierceness as a woman and say it however you want.' I knew she was going to murder this verse and bring the song to a whole new place. She was vital," he tells Variety. "I begged her to do it." The song spent seven weeks at the top of the Billboard Hot 100, but it wasn't until the star-studded video was released that Levine knew they had a hit on their hands. "Once I saw it coming together with the audio in the song, I just knew, 'This is huge, huge, huge!' It's funny—as much of an afterthought as videos have become, they're actually more important than ever because the right visual at the right time that feels genuine and powerful paired with the right song is explosive. I had to pitch each of these 25 women myself, so that was a whole process unto itself. Then I was asked, 'Do you want [Behati Prinsloo] and Dusty, your wife and girl, in it?' At first I said no [because] I don't like to have my own life bleed into the work, especially with a kid," he says, "but I thought that it would be doing my daughter a disservice to not have her as a part of this video with all these amazing women. So we did it, and it felt really good and right. And it got way bigger than I ever thought."